Emma majored in Psychology with a concentration in Counseling and Health at Emmanuel College in 2018. 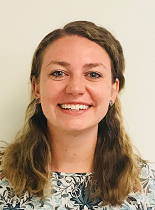 She began working at the Berenson-Allen Center in July 2018 as a Clinical Research Assistant. Emma works on various studies including The Football Players Health Study with Harvard University. Emma enjoys ceramics, photography, traveling, and spending time her family and friends. Through being a Clinical Research Assistant Emma hopes to discover what her research focus will be in graduate education. Emma has the goal to earn her Ph.D. in Clinical Psychology.